ABOUT: The Age of Adaline (also known as simply Adaline) is a 2015 American epic romance fantasy film directed by Lee Toland Krieger and written by J. Mills Goodloe and Salvdor Paskowitz. The film stars Blake Lively, Michiel Huisman, Kathy Baker, Amanda Crew, Harrison Ford, and Ellen Burstyn. 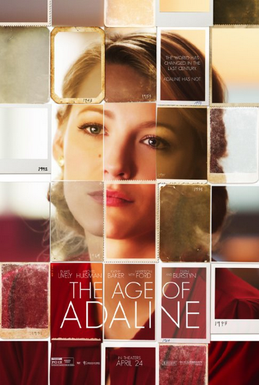 Synopsis: Adaline [Blake Lively] is a beautiful young woman who suffers an accident that changes her life forever. She has remained 29 years old for nearly 8 decades. She lives her life running away, not letting anyone get too close to her or know her secret, not letting herself fall in love. The Guardian comments, Age of Adaline… you should know: this is Harrison Ford’s best performance in 22 years. You have to go all the way back to The Fugitive to find a film that made better use of one of cinema’s bigger icons. That really wasn’t what I was expecting when I went into this mid-budget, gushy fantasy-romance flick. Vulture says, Ford is better than he’s been in ages, and it’s nice to have him back; it’s nice to see him smile again. Vanity Fair comments, Huisman doesn’t really register beyond being a handsome plot device, but Ford, so improbably turning up in this movie at all, does some of the best work we’ve seen from him in a long while. He approaches his emotional scenes with a rigor usually reserved for his physical acting. Actually, Harrison Ford was so much better than the rest of the cast, which shows us that really good acting can help a film. I mean the film was sweet, straightforward and nice. The voice-over made me want to strangle someone but apart from that, no violence here. If the film was innovative in any way, I might have liked it. It wasn’t horrible – just bland. Ford had a gravitas and sincerity about him. He was textured and layered. His subtleties revealed so much about his character. Really excellent performance. Pop Sugar says; Harrison Ford plays an old friend of Adaline’s, and when we flash back to the younger version of his character, William, meeting Adaline, you’ll swear it’s really Harrison Ford 40 years ago. But it’s not — it’s up-and-coming star Anthony Ingruber, who looks and sounds so much like Ford it’s mind-boggling. Turns out, Ingruber has been doing impressions of celebrities on YouTube for years, not limited to just Ford. Anthony Ingruber is good and probably worth a look-see on Youtube. Unfortunately, I cannot imagine that this film will help her image. She lacked depth, complexity and nuance in this film. After noting Ford’s exquisite performance I kept thinking that another actress might have been a wiser casting choice. Lively is nice to look at but lacks acting chops. Director Lee Toland Krieger, whose previous films The Vicious Kind and Celeste & Jesse Forever displayed both an elegant sense of atmosphere and focused performances, has fun jumping among the decades, and he does a solid job keeping the tone just playful enough that we don’t ask too many questions of the silly premise. Collider says about director Lee Toland Krieg; There’s a determined quality to the shot selection, an almost arm’s length remove to the emotional beats of the picture that lends itself to combating its more saccharine impulses. Yes, the shots are very clean and standard. They mirror the film…very straightforward, nothing controversial or different. While the premise of the film is interesting – no aging – the film itself is not unique at all. The premise of ‘no aging’ is familiar and popular in Vampire and Zombie flicks. There is certainly a precedent for this premise, which is manifest well or not. I might have wanted an edgier film. Lose the voice over. Show, don’t tell. Make alternate casting choices. See this film if you do not want to be challenged. Actually, you might want to check out Harrison Ford.